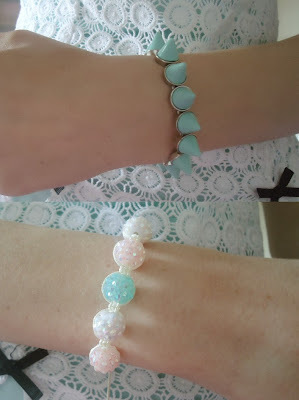 Today I'm wearing the pastel trend again, does anyone else absolutely love this trend? I think it's so pretty and girly! I really love these jeans, it feels so springtimey! I'm just going shopping for birthday presents for the boyfriend with my friend and sister today! Exciting stuff! Yes I'm loving it too! Love the bracelet, the whole outfit looks great. love love love the pastels in this outfit! the pants and mint green top underneath make the outfit so fresh and girly!